This enchanting Island will fill you with the wonder and awe of Ireland’s historic past. The west of Ireland always had an association with poetic isolation but none more so than the rugged coastlines of Achill Island. If you plan to walk the Great Western Greenway you will have the chance to stop by Ireland’s largest Island for a bit of exploration. Enjoy strolling to the soothing sounds of waves lapping up and down the pebbled shores as you make your way around the Island. When you are in this part of the world you will discover undisturbed scenery. 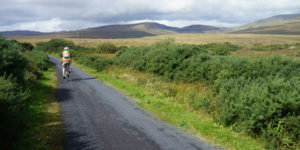 Retaining its natural beauty, the landscape in Achill is filled with wild flora and fauna. As one of the most westerly points in Europe it is common to see rare artic alpine plant species like Juniper. The remains of megalithic tombs and monuments suggest settlements in Achill during the Neolithic period, around 5000 years ago. Since then the Island has become home to over 3,000 inhabitants. Grace O’Malleys Castle is a 15th century castle, once home to the O’Malley Clan who used to be the ruling family of Achill. The O’Malleys were a well known seafaring family who refused to submit to English rule. Grace is famous as a captain and rogue pirate. The tower is 40ft in height and has three storeys. Another point of interest is the Deserted village where you will find 80 abandoned houses. This village was home to many people before the famine struck in 1845. Ireland is bursting at the edges with cosy pubs and villages. During your trip to Achill Island stop by Lynott’s bar to join in the Irish traditional music sessions. The fiddle, the bodhrán, the accordion and the tin whistle are just a few of the instruments that make regular appearances around the tables. When you are in the West of Ireland you are in for some foodie treats. Some of our favourite foods to try out include seafood chowder, a full Irish breakfast, homemade shepard’s pie and a bag of freshly picked peri-winkles. For a bite to eat on Achill Island stop by the Chalet restaurant where fresh shell-fish is caught daily. They also smoke their own salmon and have been in business for over 50 years so you are in good company. Before you return from your trip to the west of Ireland take a dip in the cold Atlantic waters to refresh your mind and body. Yes, it can be a little cold and you may shiver a little as you climb out of the rock pools but this is the perfect ending to an epic walk in this idyllic part of Ireland. Keel Beach is popular with tourists and locals for a seaside stroll. 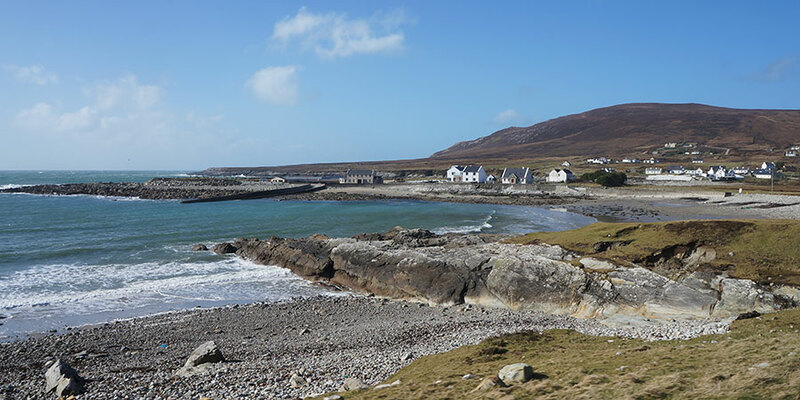 Keem Bay is popular for swimming, angling and looking out for the dolphins that frequently jump up to say hello. 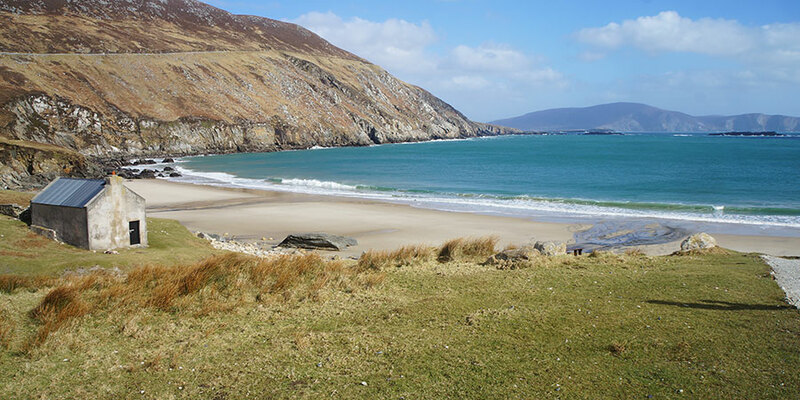 These are our top 5 things to do when you visit Achill Island. 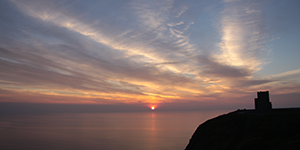 If you have any more things to see or do in Achill we would love to hear about them. For more information about walking the Great Western Greenway please contact one of our Travel Specialists. Hi Linda, Thank you for letting us know. We will keep an eye out for the Calveys in Achill. Hopefully you will get over for a visit someday soon. Kindest regards, Lisa from the IrelandWays team. 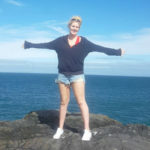 Raised in Dublin with a love for the countryside, Ciara lived in Co Mayo which is where she quickly found a passion for walks and cycles along beaches and out to Achill Island. She loves discovering a new scenic place to go for an adventure here and abroad and is loving making that a reality for other people. She cycled the last 100km of the French way and she enjoyed every minute of it!